On Friday Ukraine's Verkhovna Rada (parliament) had an unusual visitor. The grey blob toy and popular internet meme came with a mission — to call out those MPs who had failed to turn up to work. 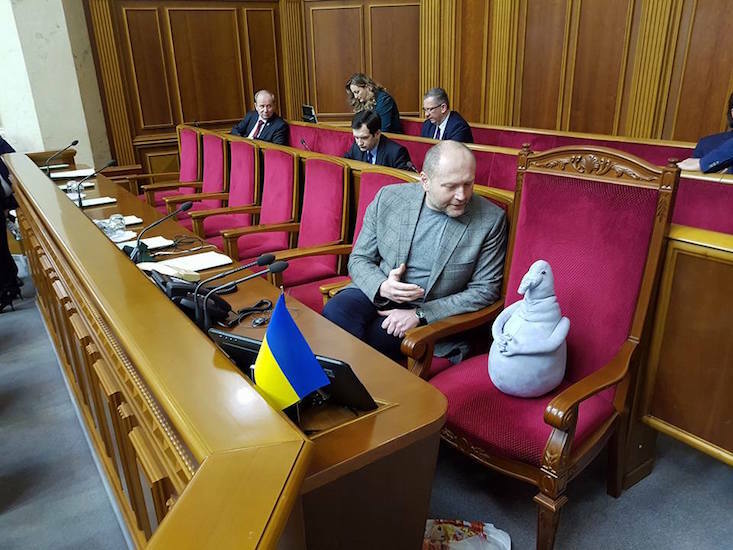 Independent MP Borislav Bereza brought the grey blob-shaped toy to a parliament session on Friday morning, pointedly placing him on a vacant seat. Who was this mysterious blob? Based on the sculpture Homunculus Loxodontus by Dutch artist Margriet van Breevoort, installed in a Dutch hospital to hearten patients awaiting news, the grey blob is an internet meme across the post-Soviet world, where he is known as Pochekun or Zhdun, meaning “the one who waits”. Thanks to Photoshop, Pochekun has found himself in a number of frustrating times of waiting: from waiting on Vladimir Lenin to finally complete the communist revolution, to sitting patiently in anticipation of Russia's Kerch Strait Bridge to Crimea. This time around, Pochekun was shaming those politicians who had failed to attend parliament at a crucial time when reforms were to be passed. Could Pochekun be pivotal in putting a stop to so-called “piano voting”? This practice sees MPs getting colleagues to vote on their behalf using their personal electronic voting cards, and is an issue that plagues the Verkhovna Rada.